Guitar Tabs for Ultimate Santana. Includes "Oye Como Va" and "Black Magic Woman." Like the phenomenonally-successful Supernatural and the somewhat successful Shaman before it, Carlos Santana's All That I Am pairs the legendary guitarist with a number of artists in order to create a melange of songs. Not surprisingly, the effort didn't result in the same level of success of either of its predecessors. With 20 million in sales and counting -- not to mention 9 grammies -- it would be virtually impossible for Santana to match the impact of Supernatural. Shaman, riding partially on the reputation of Supernatural, and partially on the radio-fueled exposure of the Michelle Branch collaboration "The Game of Love" and the Chad Kroeger/Alex Band collaboration "Why Don't You and I," went multiple-platinum. All That I Am didn't have the breakout quality (or two major hit singles) of Supernatural, or the two radio-friendly singles of Shaman. But overall, it is a more cohesive album than either of those two. In addition, the artists Carlos Santana was paired with have styles that are far more similar than was the case on the previous two albums. Unfortunately, there wasn't a "hit single" on the album; it reached gold status (500,000 in sales), but that may have been due -- in great part -- to its use in an aggressive iPod Nano campaign. Generally, the album has a rock feel, with pop, R&B, hip-hop, and Latin flavors thrown in. "Hermes," "El Fuego," "Just Feel Better" (a somewhat lackluster pairing with Aerosmith's Steven Tyler), "Brown Skin Girl" (featuring American Idol semi-finalist Bo Bice), and "Don't Wanna' Lose Your Love" (with Los Lonely Boys) are straight ahead rock songs. While each is well-crafted, played and recorded, none stand out. Even the best of the bunch, "Don't Wanna' Lose Your Love," doesn't have enough hooks for a hit single. Capturing more of a Latin vibe are "Con Santana," "Cry Baby Cry" (featuring British soul wunderkind Josh Stone and rapper Sean Paul), and "Da Tu Amor." These songs don't stray too far from the theme, but utilize more traditionally Latin elements like montuno parts on the piano, and a percussion-fueled drive. Rounding out the album in the hip-hop/R&B vein are "My Man" (with Mary J. Blige on some smokin' vocals and Big Boi, from Outkast, rapping), "I Am Somebody" (featuring will.i.am of the Black Eyed Peas), and "Twisted" (featuring neo soul singer Anthony Hamilton). Michelle Branch and Jessica Harp (The Wreckers) contribute "I'm Feeling You," a formulaic pop song (and one of the singles released) that doesn't quite capture the spirit that The Game of Love did. Finally, there is "Trinity": a rather pedantic instrumental with Kirk Hammett (Metallica) and pedal steel guitarist Robert Randolph. Carlos Santana's playing on the album is consistently good, but without the fire he has displayed in the past. 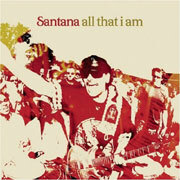 All That I Am is a pleasant listen, but will certainly never be judged as one of Santana's premiere albums. I Am Somebody Will.i.am Will.i.am Will.i.am and George Pajon, Jr.
Santana Featuring . . .